So, there you are, standing in a bed store surrounded by a wide selection of foam mattresses. That’s when you realise that from an outwardly perspective, there’s not a vast amount to distinguish between different mattresses. The sizes – from single to double to a queen to king size – will obviously be different. The cover fabric design will be different. Some of the quilting will be different. But beyond that, there isn’t much to distinguish them. They are all rectangular. They are all around half a meter in height, and they are all puffed-up and plush-looking. So, what’s the next stage? Well, you need to test drive the mattress. So, you have a good lie down to get a proper feel. This is the time you need to ask yourself some pertinent questions: Is it too firm? Is it too soft? Does your body get tossed around when your partner moves on the other side of the bed? 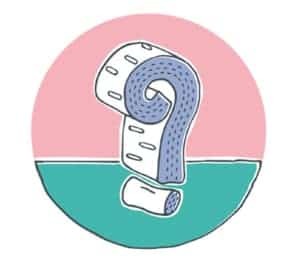 One of the most important questions of all is even though the mattress feels comfortable when you lie on it for a minute or two, but will it retain its firmness and comfort in ten years’ time? Of course, closer inspection of the label sewn into mattresses can also be a big help in selecting the best mattress. Especially if that label says ‘Genie’. The easy-to-install, bed-in-a-box Genie is a technical wonder of long-lasting comfort and support. And such is the quality that has gone into the design, and that goes into the manufacture of a Genie that not even the smallest detail has been overlooked. So, let’s examine the Genie, layer by layer. First the Genie’s top or outer cover. 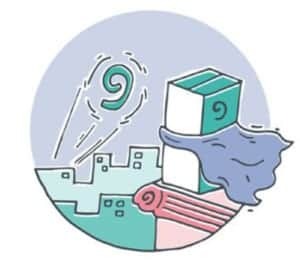 This quilted-knit fabric has anti-mite properties, which, you’ll be glad to hear, means you’ll no longer be sharing your bed with teeming colonies of dust mites, or bed bugs. It’s great news, also, that you’ll no longer be waking up with nasal congestion due to the fabric having anti-allergy properties. Look directly underneath the outer covering, and you’ll discover a layer of natural latex. Now, if there is one material that stands above all others as the premium fabric in the making of mattresses, it’s natural latex. Latex contours to your body shape and distributes your body weight across the entire area of the bed. This relieves pressure points – the aches and pains you feel on your shoulders, hips and knees in the mornings. In fact, such as the support from latex foam that it helps to improve your blood circulation throughout the night. Being 100% organic (it is tapped straight out of a rubber tree, after all), latex is what’s called a ‘breathable’ fabric. This helps you to regulate your body temperature throughout the night. 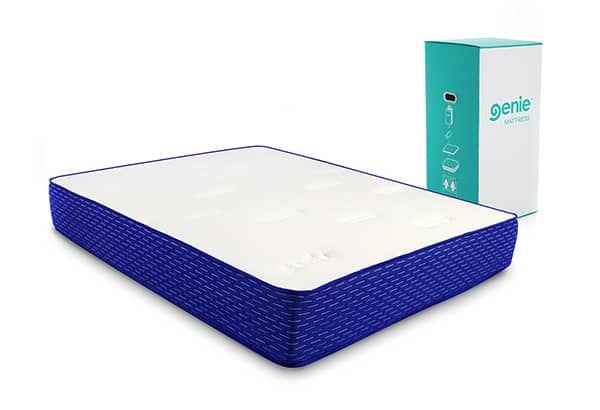 Directly underneath the latex, you’ll discover another layer of foam, which adds an extra level of comfort and support for the middle level of the mattress, the all-important pocket-spring coils. Each of these springs is housed separately in fabric pockets, and they act in a way that supports all the different parts of your body by distributing the weight evenly across five separate zones. They also contour to your body shape for head to toe comfort. And here’s another ingenious detail. Because different parts of your body are heavier than others, the wire that’s used for these springs differs in thickness so that every part of your body gets the same level of support and comfort. Underneath the pocket, springs is another layer of foam that adds the foundational support for the pocket spring section. Then finally, when you look underneath that foam layer, you’ll find the non-slip fabric that will stop your mattress from moving around on the base. Incidentally, while we’re on the subject, nothing complements Genie mattresses better than a Genie base. 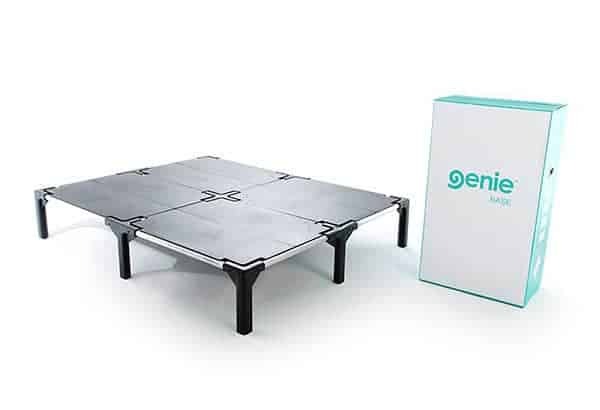 Made of virgin polymer and high-grade aluminium, the Genie base is sturdy enough to withstand 400kg of body weight. Also, unlike the traditional wooden base, it’s more environmentally friendly, and it doesn’t squeak and groan with every move you make, which is the case with wooden bed frames as they get on in years. Those are all the layers, from top to bottom of a Genie mattress, and they must always stay that way, so there’s never any need to flip the mattress over every few months. Running along the sides of the Genie are side walls comprising a framed border around the perimeter that’s coupled with high-density foam casing. Not only does this foam have a high elasticity that offers superb cushioning, but you’ll also find it robust enough to sustain its rigidity for many years to come; meaning that it’s sag-proof. You’ll also find the foam is studded with dozens of holes that allow air to circulate freely through the mattress. This helps to stop body heat build-up that happens with ordinary mattresses. So, no more waking up in the middle of the night thinking you’re in a sauna in the Sahara. 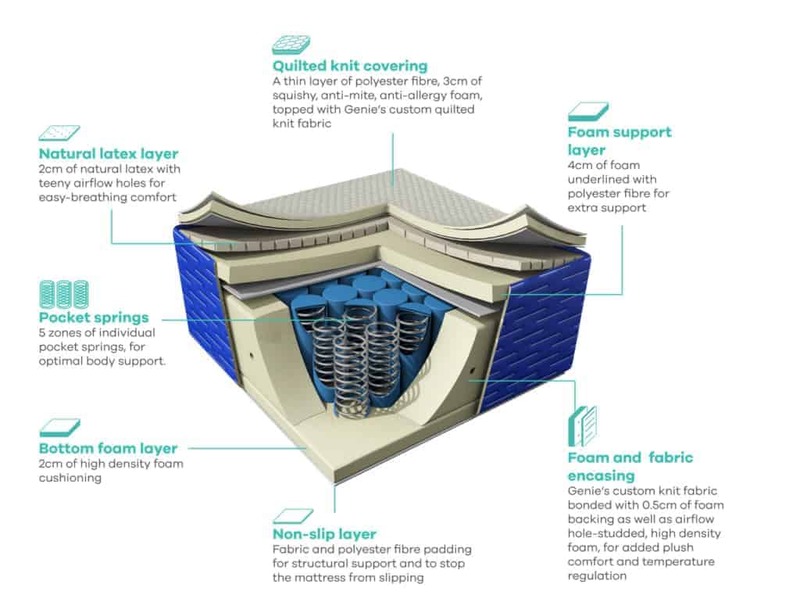 So, there you have it, a guided tour of what is, arguably, the most advanced mattress you can sleep on. And if all that technology doesn’t wow you, then here’s something else that should. Basically, Genie will give you 100 nights to try out the Genie in the comfort of your home. 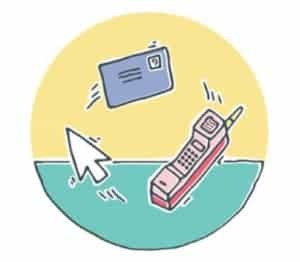 If, for whatever reason, you’re not completely happy, contact Genie, and they will gladly refund your money. This is in addition to the five-year guarantee and the 15-year warranty. 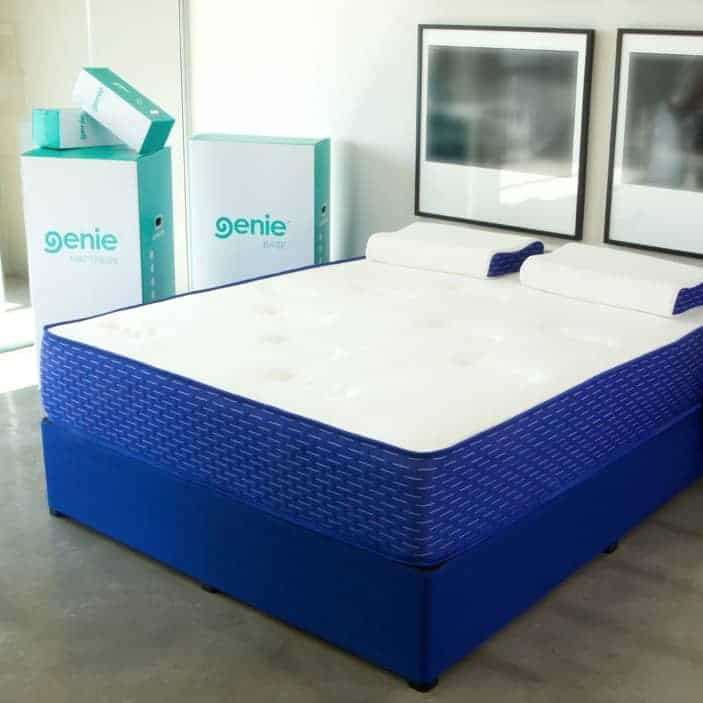 To say that a Genie mattress is like no other isn’t just marketing hype, it truly is unique, and we have a patent to prove it. To find out more about quality sleep, download our free Genie Bed guide, ‘How to Choose a Better Bed’, or visit geniebeds.co.za.